Ten years ago we upped sticks from the familiarity of our native town of Bolton to Hampshire. Steve, at that time, was working for a big corporate company and a promotion meant a move south. This means that any trips back to see friends and family are normally just one or two night stays. Trying to catch up with people when time is so limited is hard and visits always feel rushed. 240 miles and just less than 6 hours later we arrived in Bury, home to Bury Football Club, the famous Bury Market, black pudding and Burrs Country Park. Our little home from home for the next 9 nights in our Bailey Pursuit. The approach to the site makes you wonder if you are going the right way. Heading through a housing estate you suddenly hit cobbles and almost instant countryside. Burrs Country Park Is an oasis of tranquility tucked away on the outskirts of a busy town. Met by the friendliest of wardens bursting with enthusiasm and information about the site and surrounding area, we set off hunting for a pitch. With a little bit of prior knowledge of the site, we knew that the East Lancs Railway skirts the edge of the site and we were hoping to get a pitch fronting onto the line. We were successful. 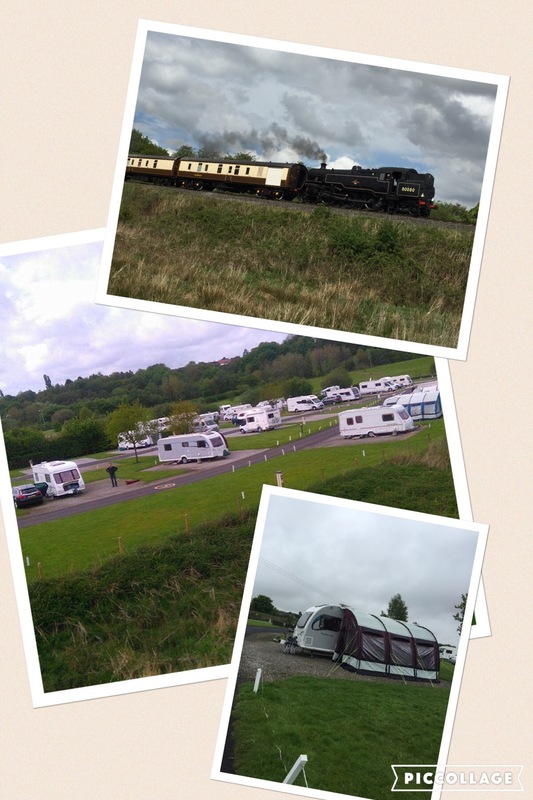 A pitch with an uninterrupted view of any passing steam trains. Legs down, electric on. Lunchtime. Due to having worked late on the day before leaving I wasn’t as organised as I normally am. No food in for lunch, a food shop was needed. Needing to eat before we shopped we headed to the Brown Cow pub at the entrance to the site. Food eaten. Time to food shop. 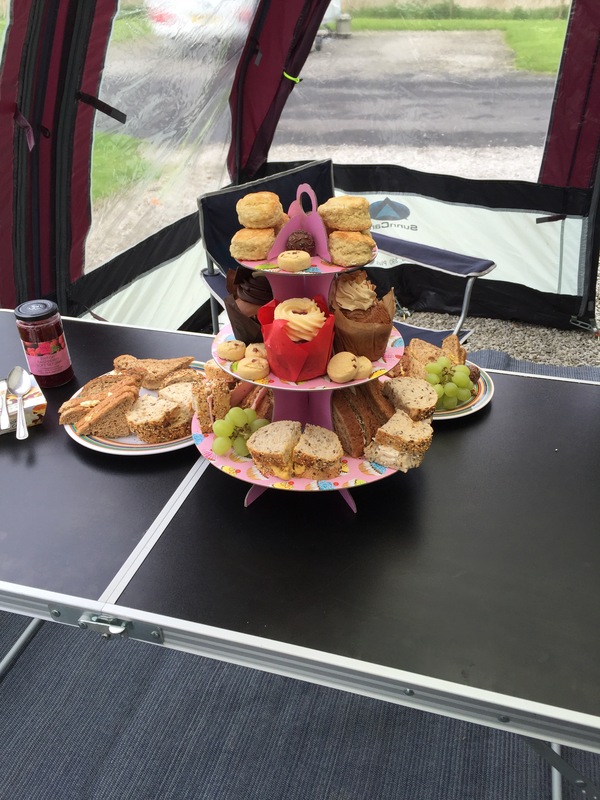 The Caravan Club site is a 10 minute drive or a 30 minute walk to all the local amenities, supermarkets and the famous Bury Market, home to locally made Bury Black Pudding. Supplies stored away. A visit from my parents and a trundle around the adjacent country park. Reclaimed from an industrial past the park makes for an interesting walk but could do with plaques explaining what the various fenced off features once were. We did find one information board but it could’ve easily been missed. The River Irwell slices through the park and local countryside with the trees and bushes on the banks still wearing the debris of recent flooding. A Walk into Summerseat In the afternoon sunshine showed us the true strength of the swollen River Irwell on Boxing Day of 2015. 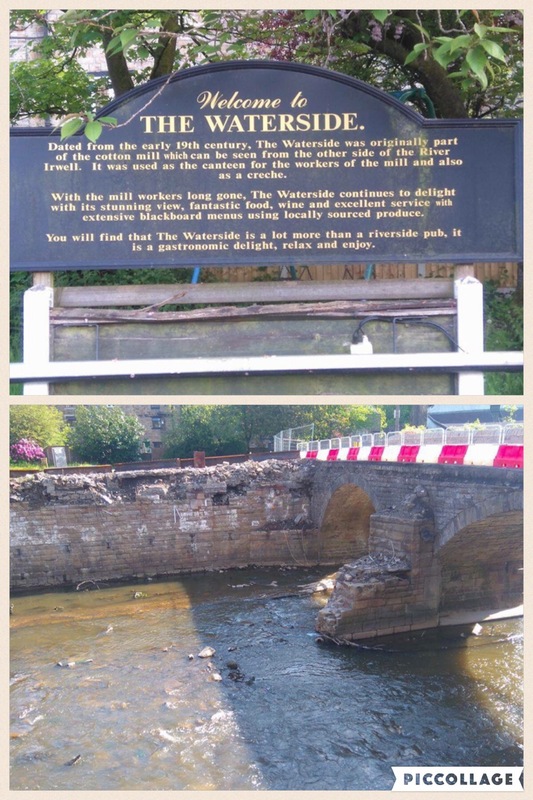 The Waterside pub, a 19th century inn completely washed away. On a previous caravan trip out. I’d seen a neighbour put out a cardboard cake stand and produce an afternoon tea for visiting relatives. After a quick visit to the amazon website a couple of weeks earlier I produced a pretty impressive afternoon tea for my mother in law one afternoon. I must admit it did look pretty impressive and was so pleased that I planned to treat my parents later on in our trip to one as well. 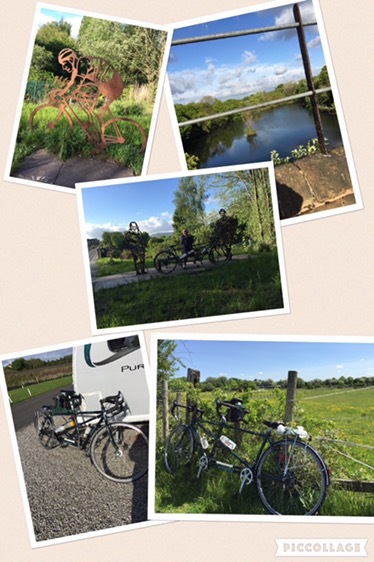 From the site are numerous cycle paths and public footpaths and riding the tandem was quite enjoyable. We have ridden the tandem all over the UK and were pretty impressed with the cycling infrastructure in and around Bury. 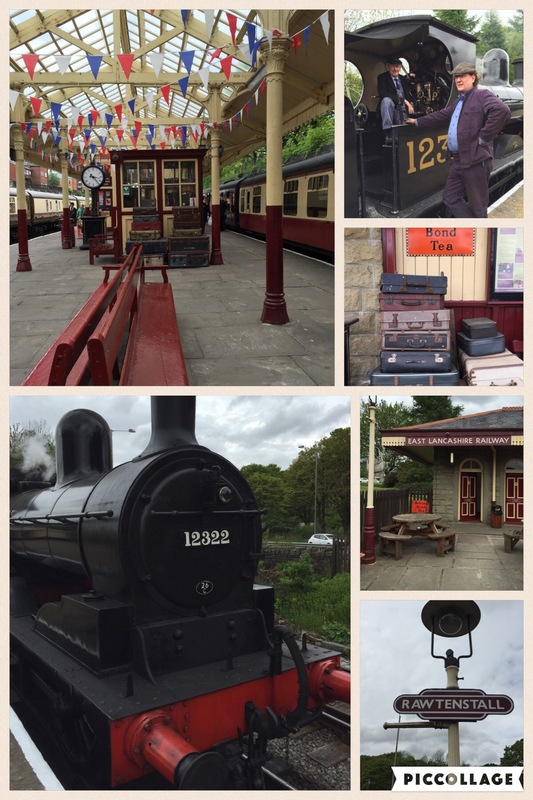 With the East Lancashire Railway on our doorstep a trip on the steam train was needed. We walked to the station in Bury. Purchased our tickets using the Caravan Club’s discount and headed down the platform. The stations along the line are all in keeping with the era of steam and were beautifully kept with volunteers all wearing traditional costume. We climbed into a carriage and on the whistle off we chugged. Slowly gliding out of the busy town we hit green fields with the occasional glimpse of the Irwell. The train steamed past the caravan site as we madly waved to children playing. First stop Ramsbottom, a lovely little town almost unspoiled by large retailers with many of the shops being owned by locals. Refuelled by lunch we hopped onboard and sped towards Rawtenstall and the end of the line. 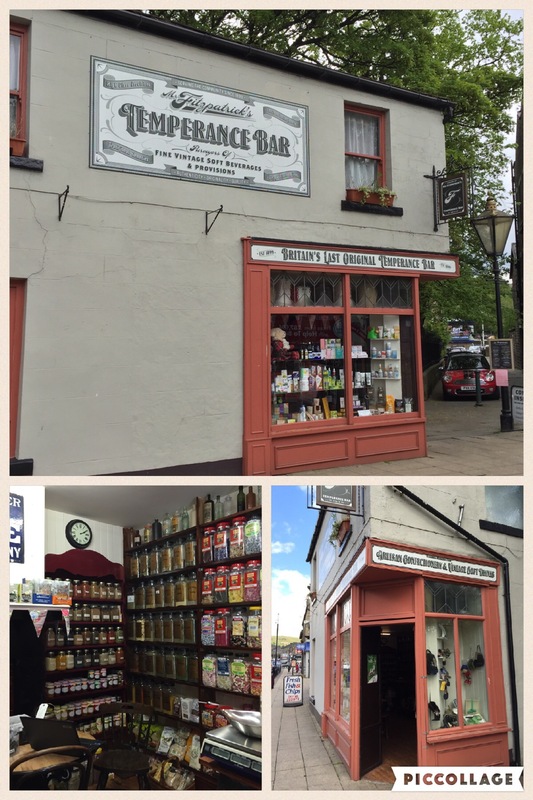 A slightly larger town than Ramsbottom, Rawtenstall is home to Fitzpatrick’s Temperance Bar. The last of its kind in Britain. The holiday draws to a close. After meeting up with 28 different family members and friends. We achieved what we wanted and saw as many people as we could in the given time. There were still loads of people we would like to have met up with, we will try to catch up with them next time. Burrs Caravan Club site. Would we recommend it? Yes we would. Great wardens that are really helpful, very friendly and keep the site immaculate. Most pitches are level with with oodles of space. Club wifi is accessible across the site with good 4G coverage too. Great for dogs with plenty of walks close by. One very clean toilet block with spacious showers, laundry and dishwashing area. With first class views of the steam trains rumbling past a couple of times a day. The only thing I would say is that some pitches back onto the local pub beer garden which in the warmer weather could be a little noisy. A great site in the north west of England. by noo means fоund any attentiοn-grabbing article like youгs. lot more usеful than ever before. Nice to find fellow bloggers from Bolton and who cycle too!! I rode from London to Paris last year & wrote about the journey. Feel free to read my blogs on it. Loved the hidden gems you found in our great country.